on Etsy, Ravelry and Craftsy. I am loving this because it is rich with texture with a lot going on but works well together! Plus, it's super soft and drapey! 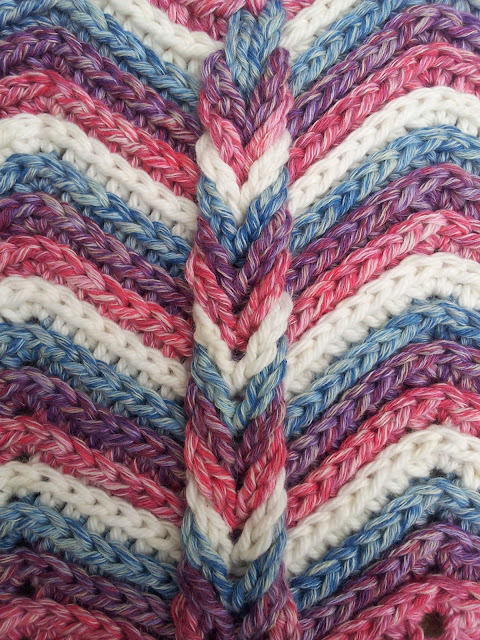 The pattern looks more complicated than it is, but most of the interest comes from slightly different stitch placements which are detailed in the pattern. 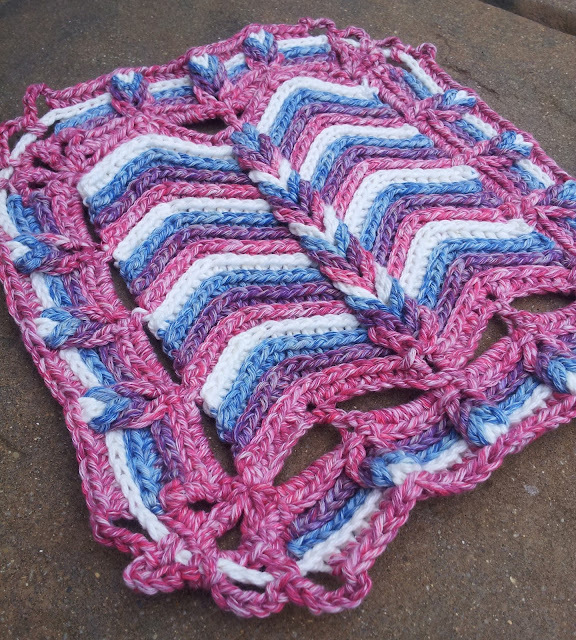 I would say this is a perfect pattern for an intermediate crocheter, but because I included over 30 pictures, almost anyone could probably do it. It's not a huge blanket. In fact, it's pretty small. But, guess what!! You can make it any size you want!! 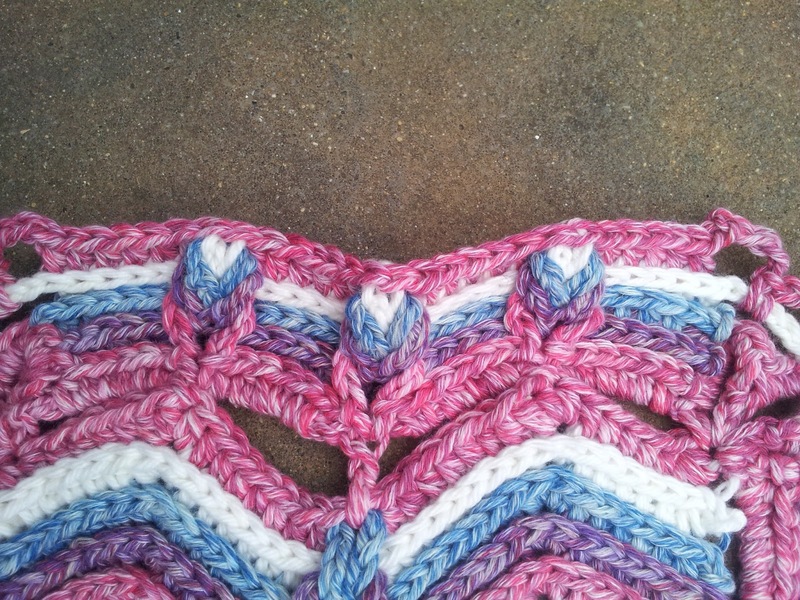 The pattern includes instructions to do just that! Nifty, huh? Want to see it in different colors? This one was worked up by my tester Christine of Yarnacles. I love the earthy colors! And the contrast with the white really makes the pattern pop! Christine is going to use her little sample shown here as a cowl. Why didn't I think of that!? Brilliant and versatile, I tell ya! This sample was made by Dedri of Look At What I Made. The yarn she used is Rowan Cotton Jeans. Awesome!! 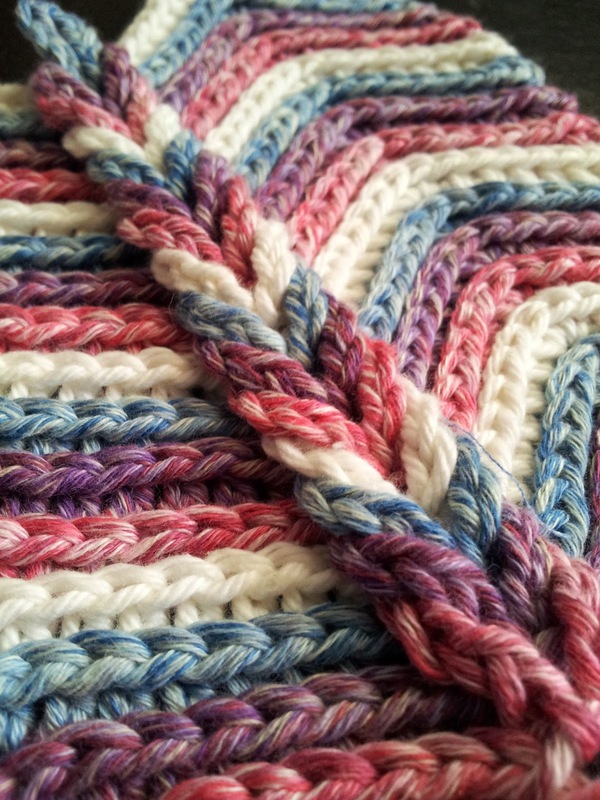 I suppose Dedri's could be a nifty potholder. Did I already say versatile? Have a wonderfully happy and terrific week! I've got something really cool to tell you! Seriously cool! So hop on over to my Facebook page here and find out what it is!! GAAAAAHHHH!! Did I say, COOL? Dance! Dance! Spin! Dance! Spin! Fall down. I'm dizzy. Linking up at my usual places and at Sweet Haute, too! This is an excellent post, very nice! I would like to invite you to SHARE this cool post at my link up party going on right now if you haven’t already, hope you stop by every week! I really appreciate your support and encouragement . Party on!!!!!! Did it! Looks like a great party! Thanks for stopping by! Susan, thank you again for letting me test for you. The blanket really is LOVELY! Have a brilliant week! Lovely pattern!! Your blanket patterns are always unique !! Stopping by from HOHD link party. Where can I get the pattern?? :)))) its gorgeous! It is available for purchase in any of my shops linked above--first sentence.